The world’s largest aquarium, the Dubai Aquarium & Underwater Zoo in the Dubai Mall, was the chosen venue of Blancpain CEO Marc Hayek for the launch of Blancpain’s prestigious new diving watch, the X Fathoms. 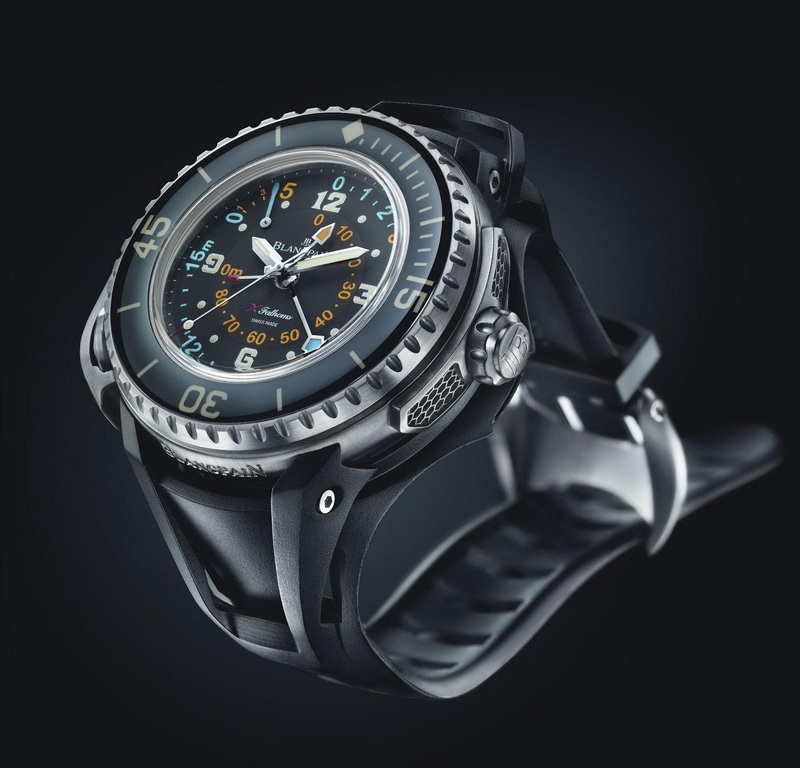 The X Fathoms is a mechanical depth gauge with several world firsts to create what Blancpain describes as the most high-performance mechanical diving watch ever made. The Fathom X movement, reference 9918B, is based on the in house calibre 1315, the same movement used in the Fifty Fathoms models. The self-winding movement is equipped with three barrels which provide a five-day power reserve, and a silicon balance-spring to withstand magnetic disturbances. The impressive 55.65mm case is made of satin-brushed titanium and is water-resistant to 30 bar or 300 metres. 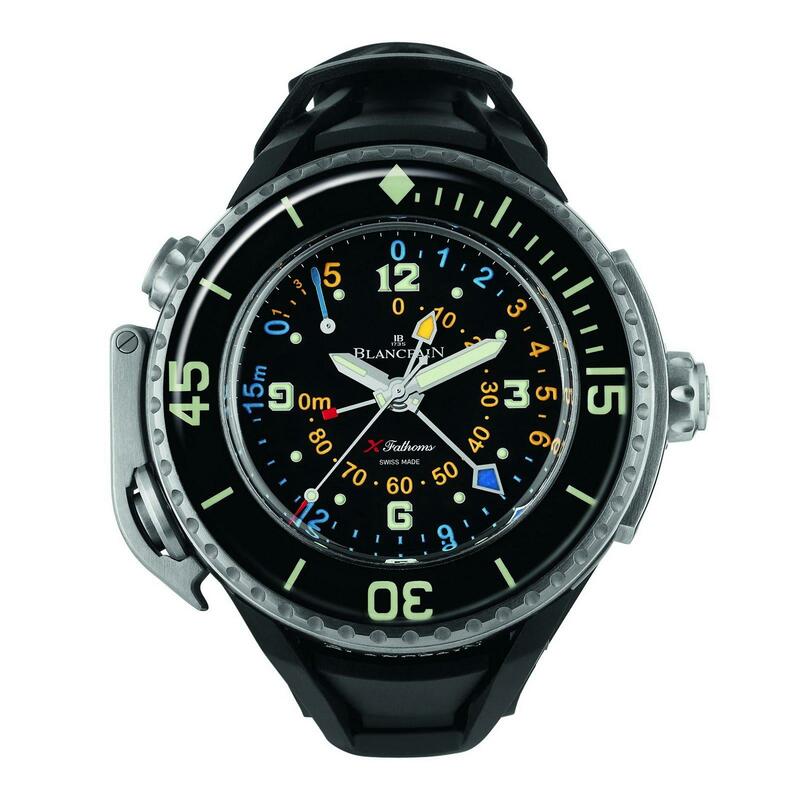 The X Fathoms also features a helium decompression valve for saturation diving. The amorphous metal chosen for the depth gauge membrane was used for the material’s elastic properties and resistance to permanent deformation. The metal used allows the thickness of the membrane to be reduced by half compared to steel, and yields a gain in precision. The long-term stability of amorphous metal avoids the risk of microcrack formation. Blancpain states that the individual calibration of each X Fathoms guarantees the precision of the depth indications. Underwater legibility is excellent thanks to central depth indication hands set against a matte black background which enhance contrast. The three-colour luminescence is also a powerful aid underwater. The Blancpain X Fathoms comes on a rubber strap claimed by Blancpain to be the most complex injected rubber strap ever conceived. 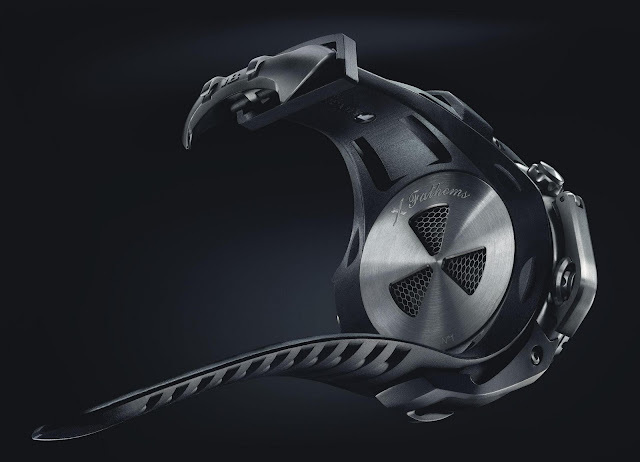 It comprises 14 articulated parts to ensure a perfect fit on the wrist and allows water to seep in under the watch in order to come in contact with the membrane in all situations. No prices supplied as yet.